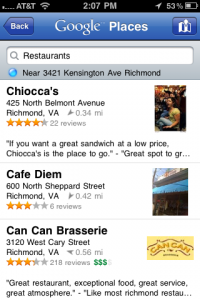 The short and sweet of it is that now customers can search for places near them from their Google Places app. Not only that, they can rate the places while they are there. This is big since many people consider total number of reviews an important factor in how well a Google Places page ranks compared to competitor sites. I took these screenshots from the app right after I downloaded it. The interface is nice and if the app catches on, it’s use by consumers could play a role in Places page optimization. The folks at Google are smart, and I’d be willing to bet that they will be applying these rankings and other analytical data from the mobile app to alter and adjust search engine rankings. 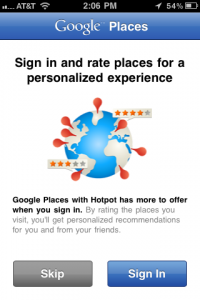 If you don’t have a Google Places page and want to get traffic from the internet, I’d suggest getting one now. And if you have a Google Places page you set up like 3 years ago and haven’t looked at in a while, it may be time to go check in on it and make sure everything is complete. Look for the “Your business info” box on the right. Under that there will be a completion bar which should say 100%. If not, finish your Places Page. It’s been suggested that you will also get penalized for not having your profile completed.